Whiff of valentine is embracing and making you succumb to the aura of Love & Romance. let your love brew with Cleopatra Spa & Salon this season as Beauty & makeover maestro Richa Aggarwal with another makeover genius Harveen Kathuria dedicated the month to Love birds and sizzling makeovers. With their dexterity they created new unconventional and out of the box looks to make your partner slay. Students from Cleopatra's Academy participated passionately in the gala event and presented line of fresh , mesmerising and sensuous looks inspired by Romantic Rendezvous of different Eras from vintage to classy & Royal to ramantic. A fusion of stunning and elaborate hair dos retro, classic, vintage era, sultry and sizzling, glam and hot looks presented with refined luxury were the bywords for romantic rendezvous. All valentine looks presented by Cleopatra were stylish and vintage yet romantic in their comprehension. Richa Aggarwal effortlessly blended timeless richness with hint of present. Beautiful Models in Flowing romantic gowns, crystals, modern silhouettes and stylish detailing added the oomph further. The color palette used for creating looks was towards the hot yet softer side with subtle warm tones following a minimalist aura. lavish embellishments added up to the exquisiteness of appearance. 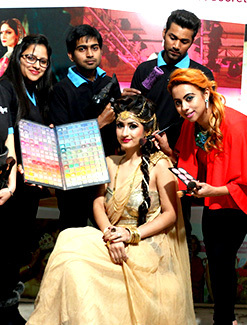 Richa Aggarwal, makeover and beauty expert with Harveen kathuria presented scintillating valentine looks that included Red carpet look that was edgy, fresh, modern, youthful and classic that any girl can try to max out her glamour and style quotient. Bollywood Glamour look that got bollywood style of love story coming forward as dramatic makeovers added to the charm of the look..
Cindrella look was hot favourite with all, If you're not walking down the aisle with your prince charming, you'll be sure to meet him tonight in this cindrella makeover.Sassy look combined sass and silk with floral styling , daring look came in choice of enriching hues.Cleopatra look was formal and classy that demanded attention and captivated all.